War, drugs, corruption, and terrorism are terms Westerners are more likely to associate with Afghanistan than biodiversity conservation. But Alex Dehgan says conservation has the potential to offer a bridge toward a more peaceful Afghanistan. Dehgan lays out his case in a new book titled The Snow Leopard Project And Other Adventures In Warzone Conservation. The book follows Dehgan’s unorthodox career from a biologist and legal expert in Russia to his time with the Wildlife Conservation Society (WCS) setting up Afghanistan’s first national park. Dehgan argues that there is “an implicit understanding” among Afghans “of the links between conservation of the natural environment and their survival”. Dehgan spoke about his adventures in conservation in Afghanistan in an April 2019 interview with Mongabay. War, drugs, corruption, and terrorism are terms Westerners are more likely to associate with Afghanistan than biodiversity conservation. But Alex Dehgan, a conservation technologist who runs the Washington D.C.-based Conservation X Labs and formerly served as the Chief Scientist at the U.S. Agency for International Development (USAID), says conservation has the potential to offer a bridge toward a more peaceful Afghanistan. 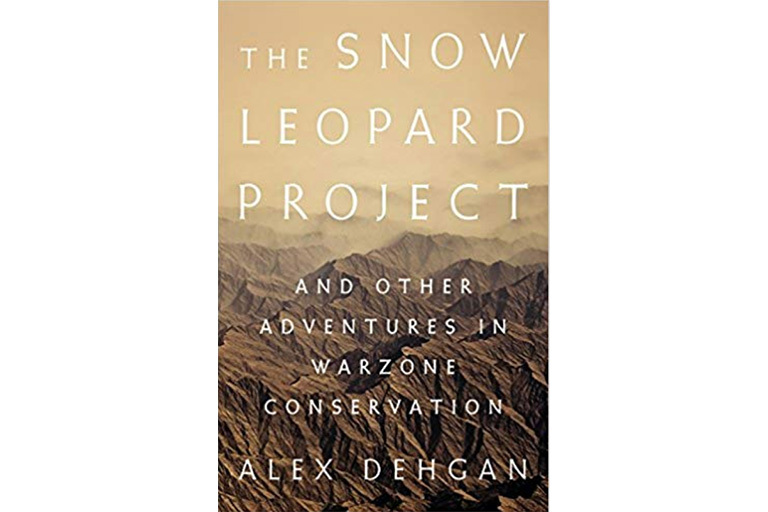 Dehgan lays out his case in The Snow Leopard Project And Other Adventures In Warzone Conservation, a book published this past January. The book, which traces Dehgan’s unorthodox career from a biologist and legal expert who helped craft environmental laws in Russia after the collapse of the Soviet Union to his work with lemurs in Madagascar to his time with the Wildlife Conservation Society (WCS) setting up Afghanistan’s first national park, argues that there is “an implicit understanding” among Afghans “of the links between conservation of the natural environment and their survival”. “Most people don’t realize that Afghanistan contains the western end of the Himalayan range, verdant coniferous and deciduous oak and cedar forests on steep hillsides, blistering red sandy deserts, Utah-like canyons and mesas, nor are they aware of its rich species diversity. Afghanistan is a country of brown bears, wolves, and caracals, hyenas, jackals and cheetahs, and elusive snow leopards, and at one point, tigers, and Asiatic cheetahs,” said Dehgan. Dehgan spoke about his time in Afghanistan and his career in an April 2019 interview with Mongabay. 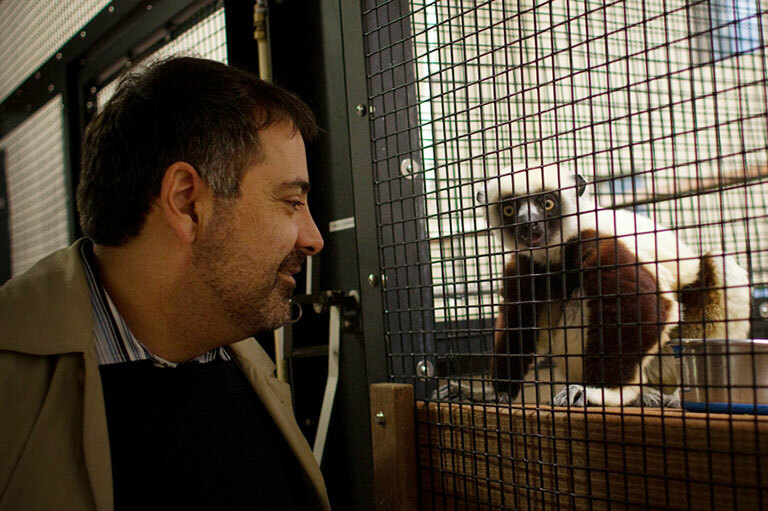 Alex Dehgan with a sifaka at Duke Lemur Center. Mongabay: What led you to write this book? Alex Dehgan: I felt that there was so much more to Afghanistan than the way it is portrayed on the evening news – a dusty, depressing landscape of pain, conflict, tribalism, and hopelessness. I wanted to show for both conservation, and for Afghanistan, that there could be optimism for the future of the country, for its people, and for its wildlife. I also wanted to portray the multilayered richness of the country, telling the stories from Afghanistan’s deep history, its amazing and gracious people, its incredible landscapes, ecologies, and geologies, and most of the incredible species that live in Afghanistan, representing a biological crossroads of Asia, Africa, and Indomalaya. Most people don’t realize that Afghanistan contains the western end of the Himalayan range, verdant coniferous and deciduous oak and cedar forests on steep hillsides, blistering red sandy deserts, Utah-like canyons and mesas, nor are they aware of its rich species diversity. Afghanistan is a country of brown bears, wolves, and caracals, hyenas, jackals and cheetahs, and elusive snow leopards, and at one point, tigers, and Asiatic cheetahs. This part of the world – Western & Central Asia, the Caucuses, the Levant, and North Africa have been largely ignored by much of the conservation community – but they are rich, important, and wondrous habitats that are deserving of our attention and effort. Finally, I wanted to tell the story because it is a great travel and conservation story, describing work done by many people and organizations, including those who came before and after me, that needed to be told. 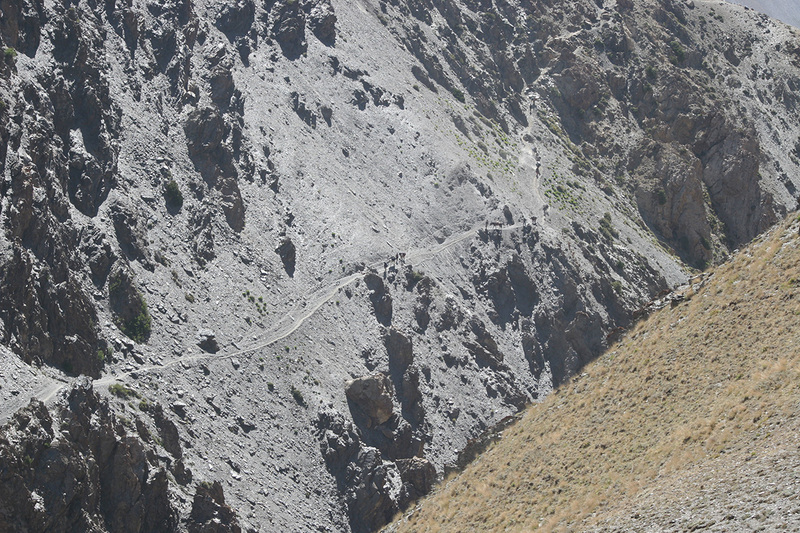 Mongabay: What was one of your more harrowing experiences while working in Afghanistan? Alex Dehgan: We once drove into a mine field, and I am pretty sure I also walked into one, which was disturbing, but it wasn’t the single incident or experience that bothered me, it was the omnipresent danger underneath. In Afghanistan, my concern wasn’t just the active killers – like the risk of a car bomb, rocket, suicide attackers, kidnapping & murder (although I had lost friends and colleagues in Afghanistan and Iraq to these and they were real dangers) – it was also the hidden evils of war and conflict. These included the mines and unexploded ordinance – that have been irreprehensibly scattered across the landscape and forgotten, silently waiting across the decades to maim and kill. It was the fact that any earthquake could hit our poorly built office and could flatten it down as has happened in Iran and Pakistan, or that carbon monoxide would smoother us in our sleep or our water heaters would explode while we were exposed. It would be losing our way in the dark driving across rivers bloated by spring snow melt where the road would disappear in the rubble of glacial moraine. It was my teams who were far from help in extremely environments in rough and remote landscapes. It was ultimately the weight of was being responsible for the lives of all of the people who I sent into the field or into the city, the Afghans that worked for us who were threatened at home, that unsettled me. 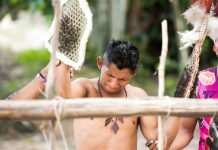 Mongabay: Conservation can be challenging under even the best circumstances. What were some of the unique issues in establishing Band-e-Amir, and the national parks in Afghanistan. Alex Dehgan: In some ways, Afghanistan was the easiest places for conservation that I had ever worked. 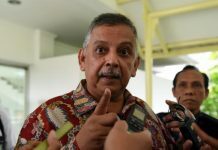 We didn’t have the problems of corruption that I had seen with conservation work elsewhere, and we didn’t face the major bureaucratic challenges. We had incredible support and welcome from all levels of government and the Afghan people. There were still significant challenges. These came from the legacy of three decades of conflict. There was so little known for the last thirty years – we didn’t have good historical data that we could compare against. We needed to establish a set of rules and laws in a country that was just reestablishing the rule of law – this foundation was difficult to create in a place that had suffered from lawlessness for three decades. Security affected us in a multitude of ways. We had to be concerned not only by insurgent groups, but the drug trade, by mines and unexploded ordinance, by failed infrastructure, and planes that we would take labeled by the European Union as “flying coffins”, and by the threats to our staff and their families for collaborating with Americans. There was a risk WCS team members could be labeled as insurgents and killed by NATO and U.S. forces, or that we would be in the wrong place at the wrong time and get bombed or shot by either side of the (post)conflict. Finally, the remoteness of some of the areas we worked also required extraordinary logistics solutions. 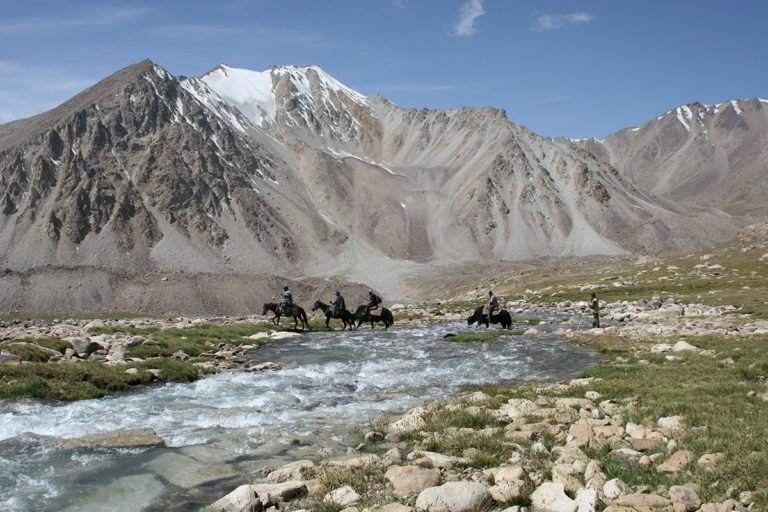 This remoteness cut two ways – it ultimately protected the wildlife, but it also required WCS teams to travel by Yak or horse for even weeks at a time through high elevation regions. Such remoteness that could be potentially fatal in an accident because it would take days to extract someone, even though we had contracted with teams of first responders with specialized high-altitude helicopters accompanied by soldiers to rescue our staff, and trained our team to self-rescue until help could arrive. We had tradeoffs we made in reaching our field sites – that we could put ballistic blankets under the cars to protect us from certain types of mines, but we couldn’t also support the weight of ballistic blankets or armoring on the sides of the vehicles which would protect us from gun fire since the vehicles would become too heavy to go into the field. Mongabay: And what are some of the similarities/cross-cutting issues between working in Afghanistan and other parts of the world? Alex Dehgan: Wildlife trade was a surprising issue in Afghanistan, but in this case, it was actually driven by the humanitarian community itself – the U.S. and NATO soldiers, the UN officials, the development NGOs and contractors. 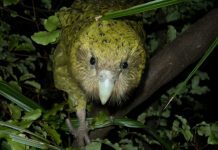 In some cases, wildlife and timber trafficking was linked to networks that were undermining the country’s security as well. Other issues were shared too – impacts of climate change, deforestation, and a lack of rule of law and effective environmental regulations. In Afghanistan, like other places in the world, a top-down approach to conservation wouldn’t work for people who have been fiercely independent for millennia. 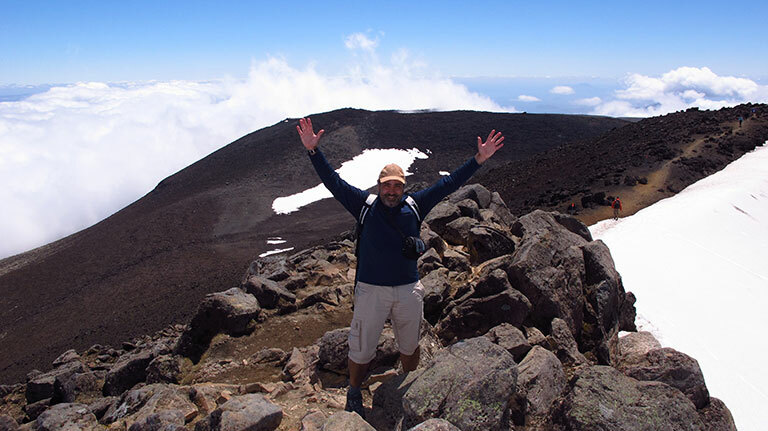 We needed to invest in and work with local communities to empower them to manage their own natural resources for their own survival and for that of the wildlife, and train them in the science and the consequences of their decisions – this was the genius of Peter Zahler at the WCS – who helped design the program. This is true whether you are working in Wyoming or the Wakhan Corridor. We had to reconcile economic interests of the local people and the wildlife, and create opportunities that would ultimately help both. Finally, we needed to tie the conservation of Afghanistan with the protection of Afghan identity, and create significant incentives to motivate others. 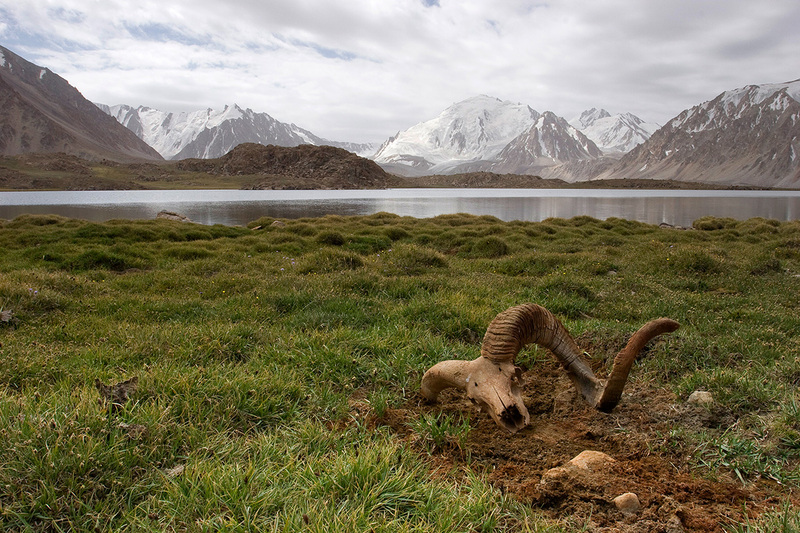 Marco Polo sheep skull embedded in the soil with the Pamir mountains in the background, part of Afghanistan’s Wakhan National Park. Photo courtesy of WCS. Mongabay: Given the long-running conflict in Afghanistan, it seems like conservation would be a distant issue for most people. 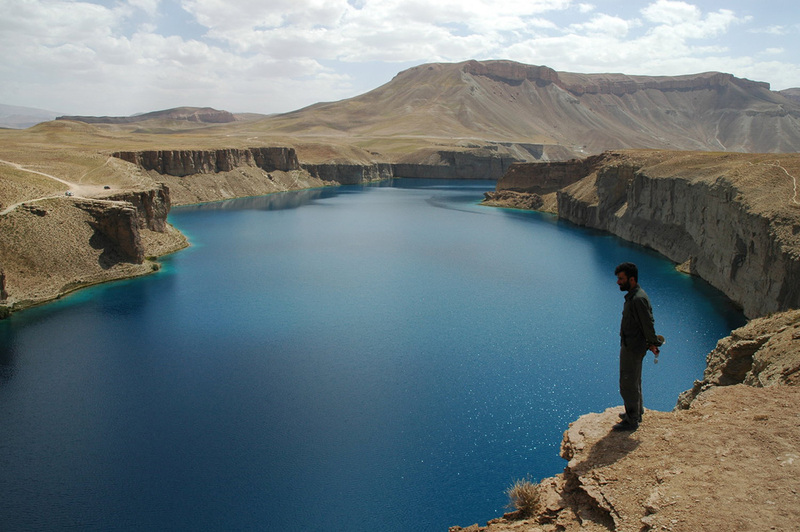 How was the case for Band-e-Amir made to decision-makers in the country? And how was Band-e-Amir received by the public in Afghanistan? 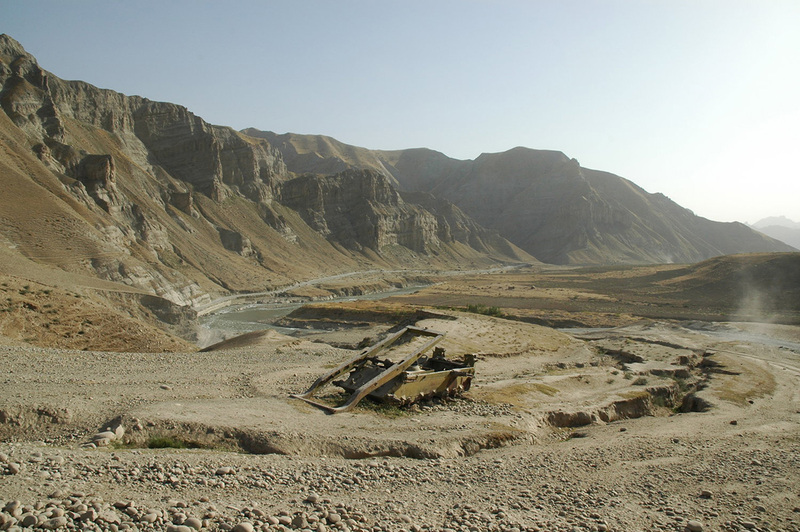 Alex Dehgan: For westerners, the idea of conservation in Afghanistan was perhaps surprising. 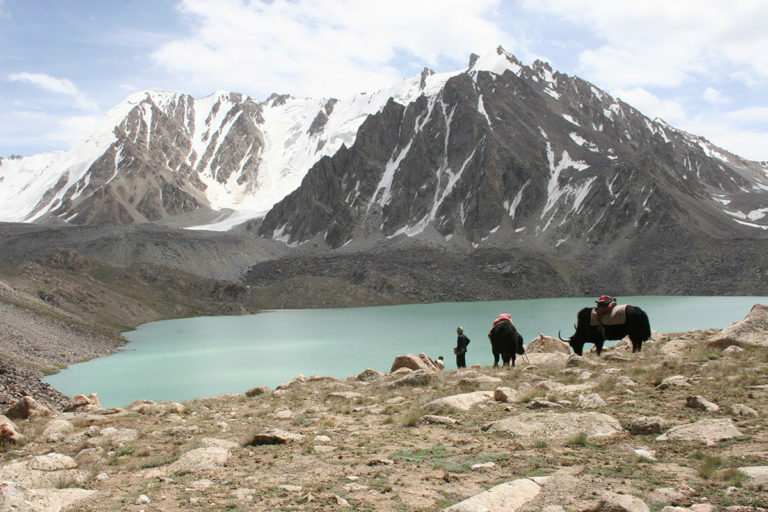 However, for the Afghans, there was an implicit understanding of the links between conservation of the natural environment and their survival. Eighty percent of the country is dependent on natural resources, and the fate of those resources affects wildlife, livestock, and humans alike. Moreover, the Afghans deeply identified with its spectacular wildlife. For a country where 20% of the population were refugees in Iran and Pakistan, protection of the Afghanistan’s unique species was a way to protect their identity. We were not significantly bothered by corruption when we started the program, but saw enthusiasm from members of parliament, from the national, provincial, and local governments, and for that, we are grateful. 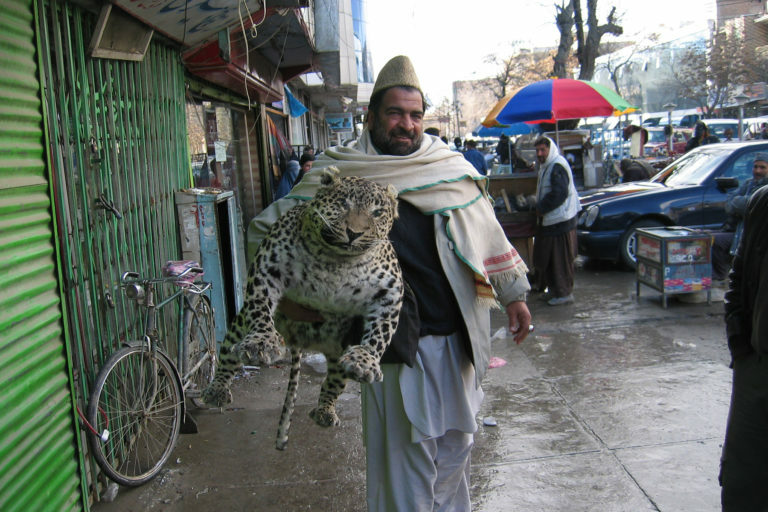 Afghan man carrying a stuffed leopard down the street in Kabul. The real driver of wildlife trafficking in Afghanistan was however international military forces, humanitarian NGOs, and development contractors. Credit WCS/Lisa Yook. 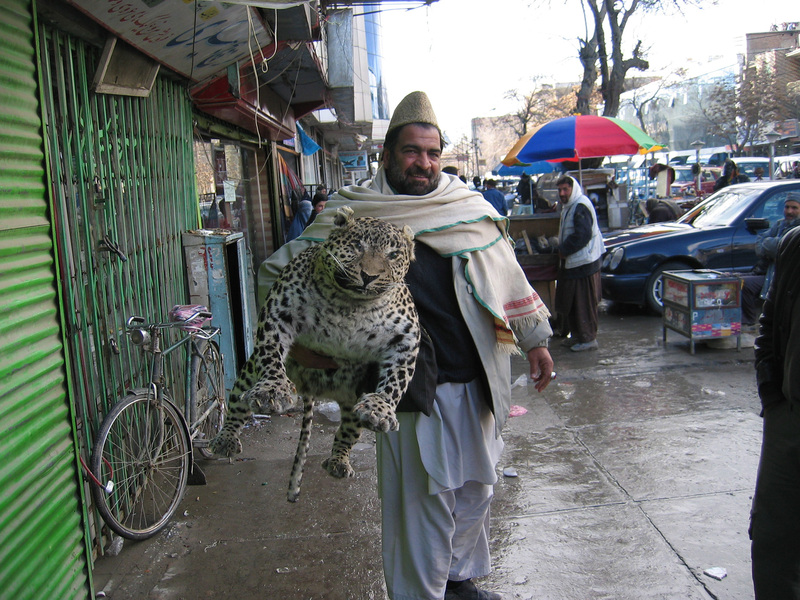 Mongabay: How has wildlife fared in Afghanistan since you first arrived in 2006? Alex Dehgan: We believe better. The creation of new environmental laws, new environmental institutions, new protected areas, opportunities for revenue sources from tourism (which was the number two source of income in the country in 1979), and new cadre of environmental managers, from park guards to professionals, provide hope. However, I am most excited by the new leadership of Afghan conservationists, and this only comes because institutions like WCS, USAID, UNEP, UNDP, and others, have invested heavily into their education. They are the hope for the future. There are still serious concerns with wildlife trafficking, the number of weapons in the country as a result of decades of conflict, the security situation and the rule of law. WCS teams cross a small river in the Big Pamir, within the Wakhan Peninsula, which became part of Afghanistan’s second national park. Courtesy of WCS/Don Bedunah. Mongabay: What was you take away from the experience of working in Afghanistan? How did your time in Afghanistan inform or influence the work you do now at Conservation X Labs? Alex Dehgan: In the most fundamental sense, Afghanistan gave me a sense of profound optimism of our ability to address problems that are, upon first glance, seemingly impossible. If we could make conservation work in Afghanistan, we can address extinction and climate change. Many of the solutions we used in Afghanistan would also inform approach we would take at Conservation X Labs. 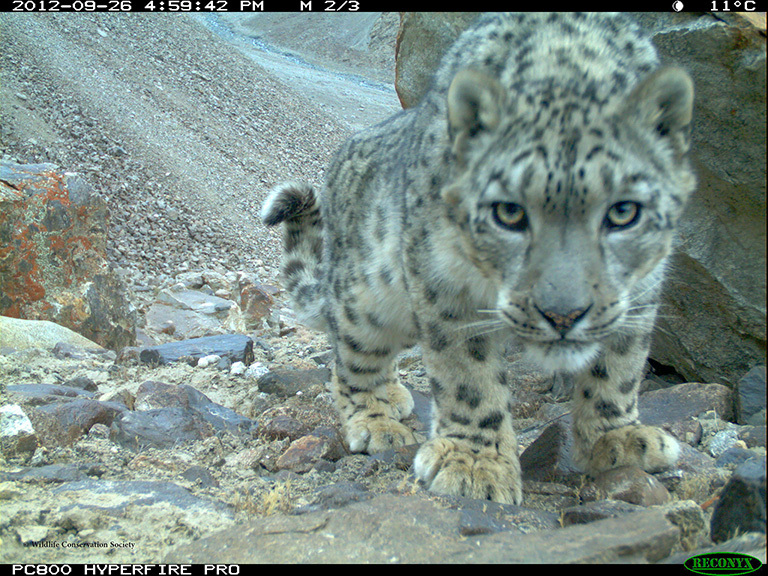 In the WCS project, we would seek to understand and address the underlying drivers of extinction – from understanding the reasons behind the underlying degradation of the rangelands necessary to protect both Marco Polo Sheep and livestock – to creating programs to mitigate the persecution of snow leopards. We would also work to harness human behavior rather than fight against it. We used behavioral interventions such as social marketing by working through religious imams, and tying our work to the identity of the people itself, and changing perceptions and demands among the international community about acceptable behavior and how they saw Afghanistan. Much of our work at Conservation X Labs is about democratizing science and technology – to given anyone anywhere the tools to protect the environment. This was our work in Afghanistan too – to empower the local communities to protect their environment. Lastly, I was successful in Afghanistan because I worked to build a coalition of institutions and people – the successes we saw in Afghanistan weren’t due solely to me or even the WCS, but because many institutions and individuals – Afghan and international, including those that came before me and after me played a role in this effort. Conservation is too often competitive, and petty, but through our combined efforts – through partnerships – we can achieve much more. 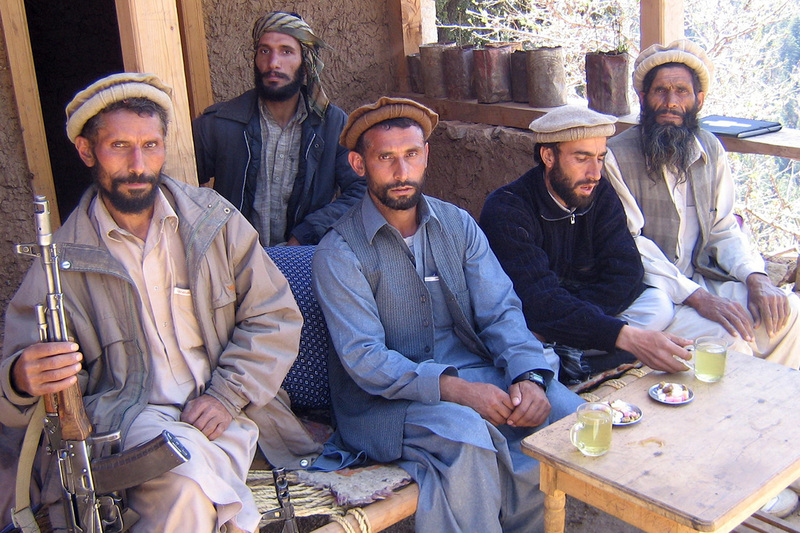 My experiences in Afghanistan would also profoundly affect my work with USAID later when I served as Chief Scientist. My insights into how USAID’s operations in Afghanistan were actually myopic and undermined U.S. overall strategic goals made me join USAID to reform the Agency itself. I found an agency that had significant deficiencies in how it measured impact, how it managed geospatial data, in the technical credentials of its staff, and their ability to create adaptive systems, in its procurement systems, that all influenced the reform efforts I developed and led under President Obama. Mongabay: How is the book being received so far? Alex Dehgan: The book has received exceptionally positive reviews so far, including by Nature, Science, NPR, and the trade press, and it has been selected as among the best new releases of the year to date by some environmental publications. What has been exciting is seeing the number of different book genres that the book has gotten traction in – from the expected – history and conservation – to the unexpected – entrepreneurship and innovation. Probably the best part of writing this book has been the total support I have gotten from people and institutions from my past and present, including the Wildlife Conservation Society and Duke University. Alex Dehgan, author of The Snow Leopard Project And Other Adventures In Warzone Conservation and founder of Conservation X Labs.